This little loom has everything a large loom has, except the size. It has all possibilities of a large loom with 4 shafts, but of course you can weave no wider than 30 cm. This junior is more complex for the novice weaver and it requires more preparation than a frame loom or than the 'benjamin', but you can weave all possible fabrics and it weaves much faster. The loom is 47 cm wide, 56 cm deep and 25 cm high. It is fully demountable. It is made of beech wood and galvanized iron. It has four shafts, on which polyester heddles (Texsolv) of 15 cm fits. It has a loose beater for a standard metal reed (comb). The warpbeam and clothbeam can be fixed with wing nuts on both sides. Two metal rods, to tie the warp threads, can be attached to the warp and cloth beam with loops. If you turn around the loom, you can fold out a small warping frame to prepare the warp. The loom will cost € 125.00 , without heddles nor reed. 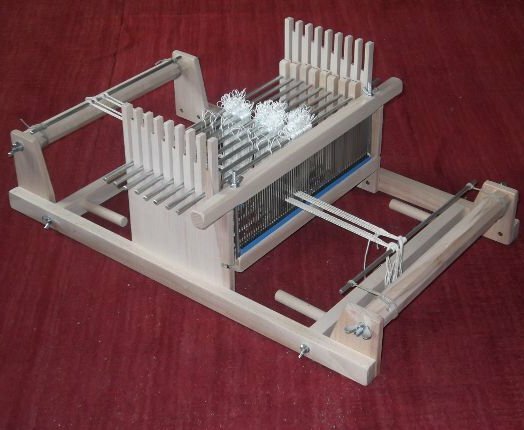 This loom with 200 heddles, an inox reed no 4, a heddle hook (Texsolv) and 2 flatt shuttles of 30 cm will cost € 180.00. The heddles are sold separately for € 15.45 per 100 pieces. A reed will cost € 22.40 for one with 2 dents per cm, and € 29.00 for one with 12 dents per cm. 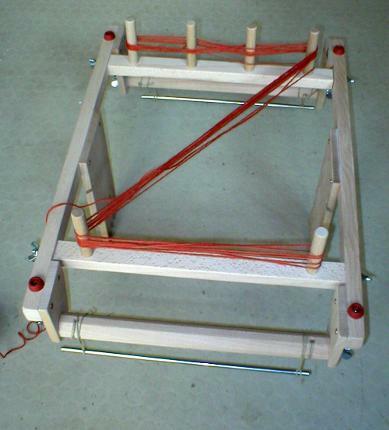 You can use a simple raddle with the loom (€ 12.00). You can have the junior loom with 8 shafts too. 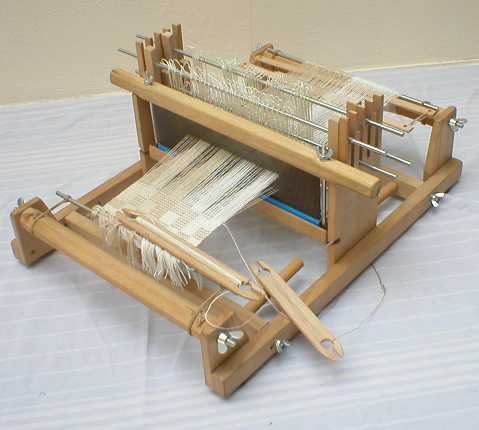 The dept of the loom is then 66 cm and the price € 160.00 , without heddles nor reed. 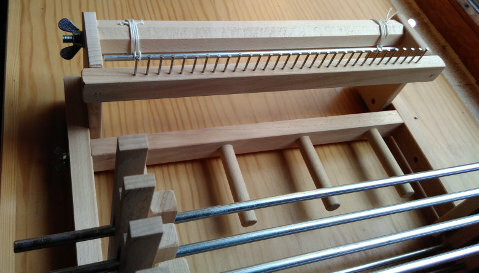 This loom with 300 heddles, an inox reed no 4, a heddle hook (Texsolv) and 2 flatt shuttles of 30 cm will cost € 230.00. How to use the little loom?